First of its kind in the world, an open-air movie theater exclusively for motorists has just been opened at Camden, N. J. Patrons drive in and park their cars in semicircular rows. 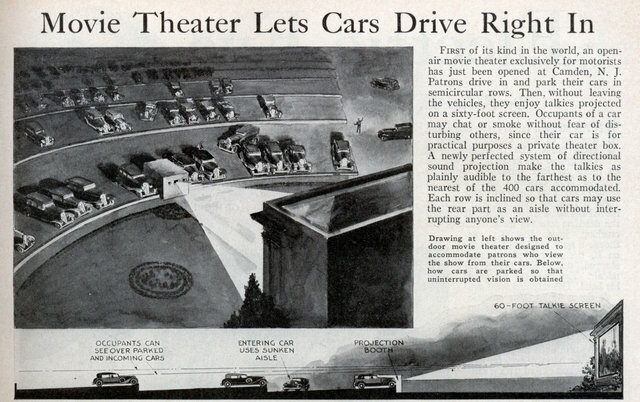 Then, without leaving the vehicles, they enjoy talkies projected on a sixty-foot screen. Occupants of a car may chat or smoke without fear of disturbing others, since their car is for practical purposes a private theater box. A newly perfected system of directional sound projection make the talkies as plainly audible to the farthest as to the nearest of the 400 cars accommodated. Each row is inclined so that cars may use the rear part as an aisle without interrupting anyone’s view. It’s such a new idea that they haven’t realized that they’re only utilizing 1/2 of their audience capacity – that will change very quickly. And what’s this? No Snack Bar??? That will change, too! Me neither. Luckily I don’t have to pick, I can just post both! The little humps that tilt the cars up, a higher screen, dancing snack bar treat ads, and the projector at the back of the lot will make the difference. 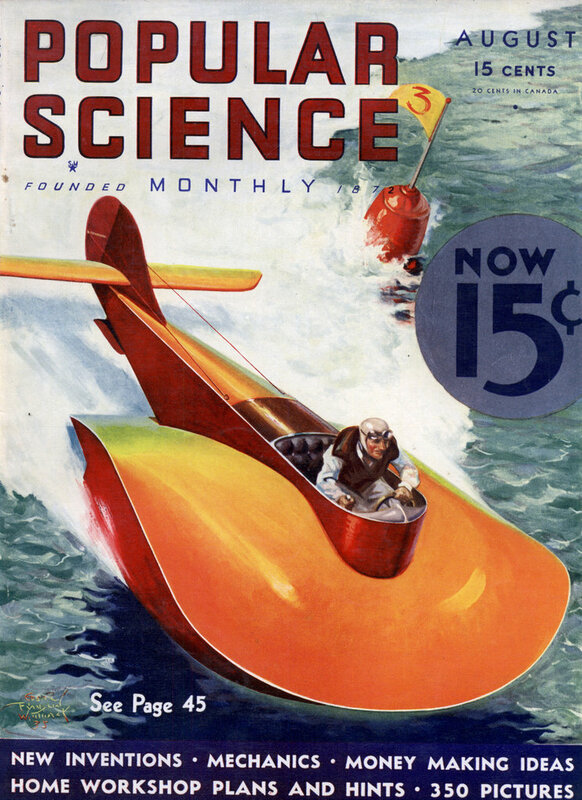 I like the crazy-failed myself- especially all the plans for downtown airports or flying wing airplanes. The good old days! Simpler time with less worries! !